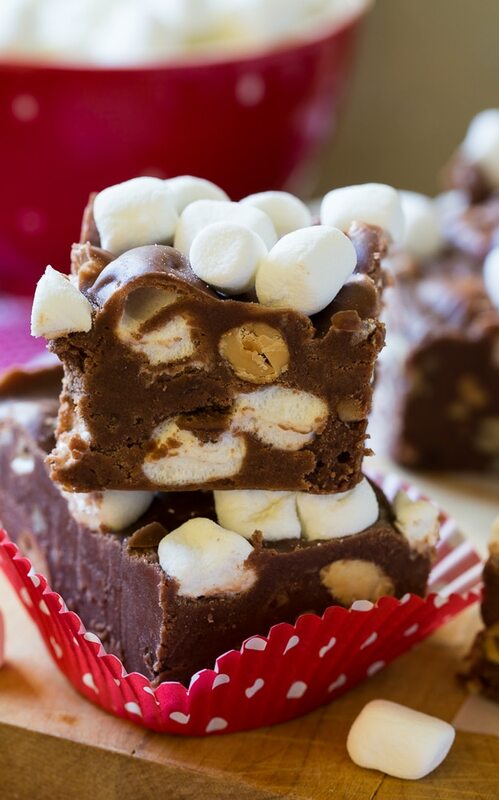 Rocky Road Fudge is loaded with chopped almonds and marshmallows. It’s ultra-rich and only takes 10 minutes to make. I don’t think anything makes a more welcome food gift than rich and chocolaty fudge. You show up on my doorstep with a tin full of fudge and we will be friends for life. It’s my favorite and I’ve been known to make a batch of fudge and eat pretty much every last piece of it. 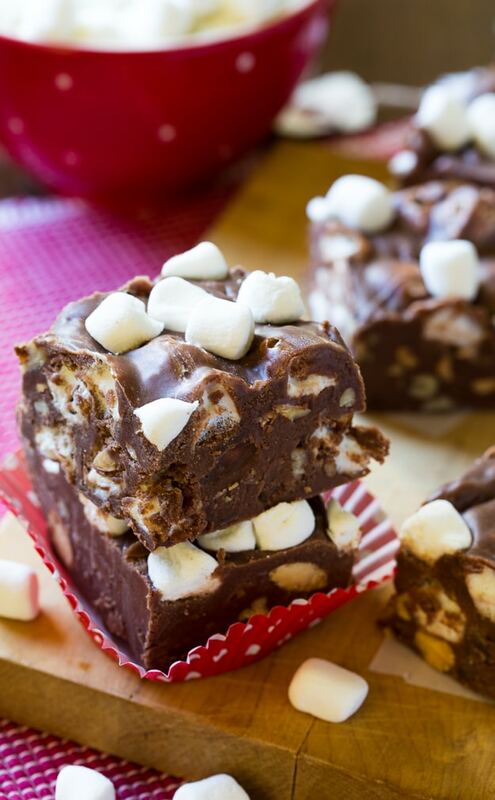 This Rocky Road Fudge is both fun and delicious and I think it appeals to kids and adults. 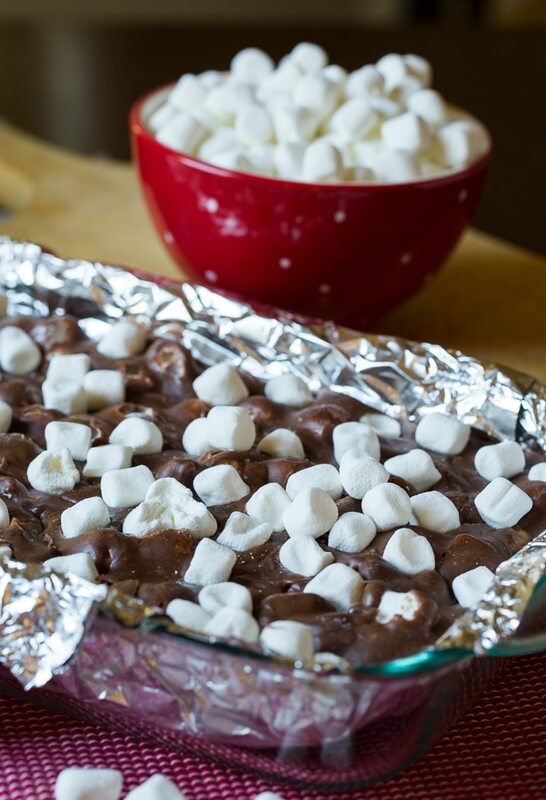 It has a rich, super sweet base made from sugar, evaporated milk, melted chocolate chips, and marshmallow creme with lots of chopped almonds and mini marshmallows mixed in. I love the way the almonds taste but you could use another nut or a mixture of nuts. Pecans and walnuts are good too. I’m going to put this Rocky Road Fudge right up there with Buckeye Fudge and German Chocolate Fudge as one of my favorite fudge recipes to make for Christmas. 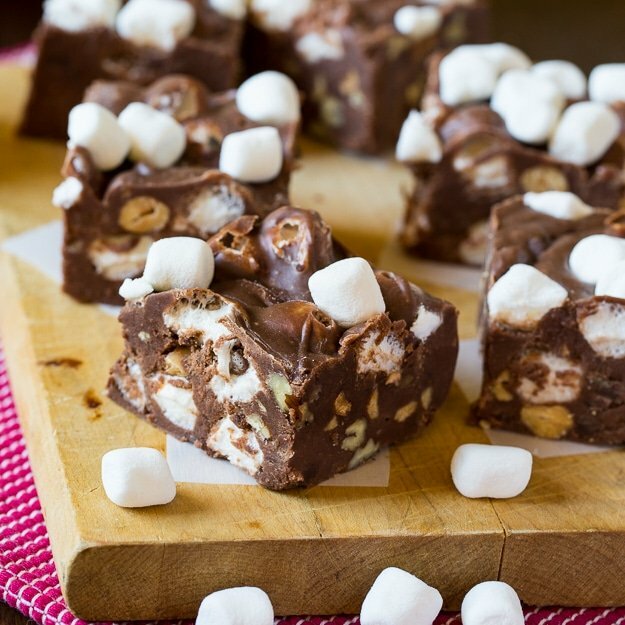 Rocky Road Fudge is loaded with chopped almonds and marshmallows. It's ultra-rich and only takes 10 minutes to make. Line a 9X13-inch pan with aluminum foil. In a medium pan, heat sugar, butter, and evaporated milk over medium-high heat. Bring to a boil and cook for 4 minutes, stirring continuously. Remove pan from heat and stir in chocolate chips and marshmallow creme until melted. Stir in vanilla and almonds. Quickly stir in 1 cup of frozen marshmallows and pour into prepared pan. Stir as little as possible so marshmallows do not melt. Sprinkle remaining marshmallows on top. Cool completely before cutting. Freezing the marshmallows helps them keep their shape when you mix them into the fudge. 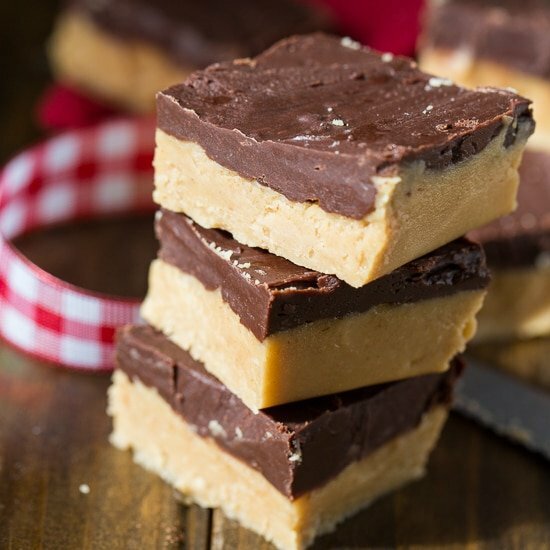 This entry was posted in Desserts, Other Desserts and tagged Christmas, fudge. Bookmark the permalink. I’m not sure why these didn’t turn out..when the condensed milk and sugar was cooking, it didn’t take the full 4 min before it started to fizz and overflow. The choc chips turned it a light brown color, not dark brown and it didn’t set. I feel your pain. I had the same experience. I put the fudge in the refrigerator for 2 days to dry it out, then I managed to cut it in pieces (more like lumps ‘cuz it was still mushy) and then put each piece in a mini baking cup liner to let it dry out a couple more days. End result is a very ugly but tasty fudge. Maybe the recipe would be more successful if you followed it! The recipe as written calls for evaporated milk, not condensed milk. They are VERY different products and a novice cook could easily make the mistake. Please be sure to read, and re-read the recipe before reviewing it. I thought it turned out well – and I followed the recipe as written. I followed the recipe as written, using the evaporated milk, and it came out light brown and grainy. I feel like something is missing in the directions. Alexandra: I followed the recipe exactly but if you’ll notice, it calls for one 5 oz can of evaporated milk. There is no such thing. I tried a full can of evaporated milk and it didn’t set up for days. Then I tried 5 oz evaporated milk and it is too dry and grainy. I checked out other recipes and they all call for condensed milk, not evaporated milk. Going to try that next. I’m glad your batch turned out…. it seems to be the exception. Did you use 5 oz, or a full 16 oz can of evaporated milk? Fudge definitely makes great gifts, and glad to know if I ever show up on your doorstep I should be carrying fudge! Love the addition of marshmellows and almonds! Fudge-tastic! Pinned! Cheers, my dear! This is the perfect treat for gift giving! 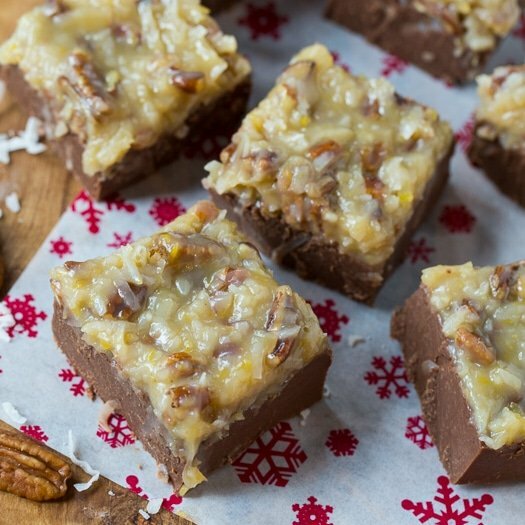 I can’t believe Christmas is so soon — I need to get to the kitchen and make this ASAP! I can’t believe Christmas is so soon either! Yum! I love fudge, especially this time of year! And I love that this has marshmallow and marshmallow creme in it! You know what Christin – if you showed up on my doorstep with a tin full of fudge – we will be friends for life, too! 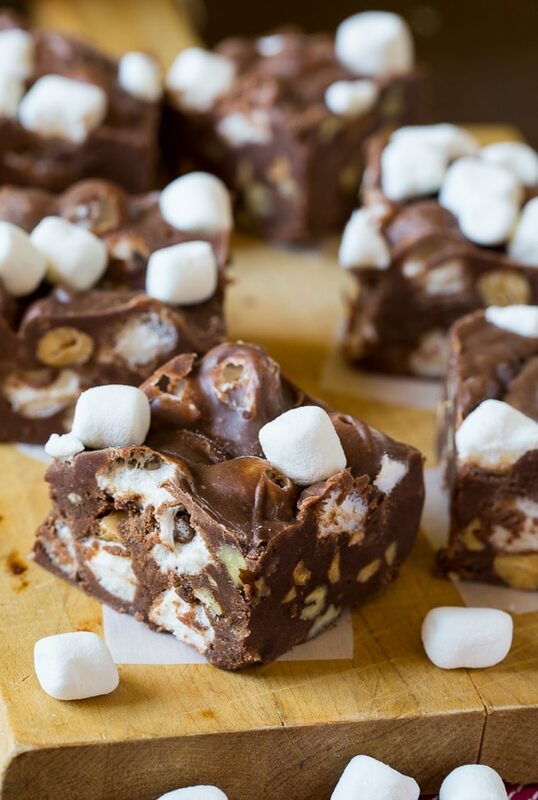 🙂 This rocky road fudge looks so insanely decadent – like a hug for my tastebuds! I haven’t had such fudge for ages.. Great sweet treat! I miss it.. These are screaming Christmas to me! Love all the deliciously decadent treats we get to make, share, and eat in December.